Kuttanellur is a residential area situated in the City of Thrissur in Kerala state of India. Kuttanellur is Ward 27 of Thrissur Municipal Corporation. It is around 6 km away from the Swaraj Round. Kuttanellur is home to Oushadhi, a Kerala Government undertaking for manufacturing Ayurvedic medicines and a Government Arts College. It is accessible from Thrissur town and via NH 47, connecting Thrissur with Ernakulam. 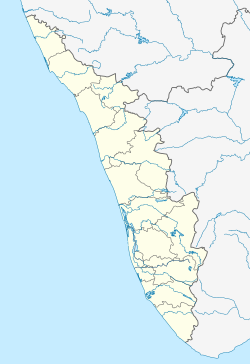 Nearest suburban areas are Mannuthy and Ollur. It is famous for its Bhagavathi temple and the annual Kuttanellur Pooram. Kuttanellur is home to Oushadhi, a Kerala Government undertaking for manufacturing Ayurvedic medicines and Sri C. Achutha Menon Government College. ^ "Municipal Council". Corporation of Thrissur. Archived from the original on 24 December 2012. Retrieved 30 June 2012. ^ "All Information on Kerala". THRISSUR CORPORATION. Retrieved 30 June 2012. This page was last edited on 18 February 2019, at 00:58 (UTC).